These webcomics are the result of a partnership between the Leonard Lief Library and the Art Department at Lehman College, City University of New York (CUNY). Each year, one or two talented art students are invited to work with faculty in the Art Department and the Library to develop a new comic. The broad goal of the comics is to advance information literacy and awareness of the Library’s role on campus. With that goal in mind, each comic is accompanied by texts that highlight key information literacy issues and prompt further exploration. Producing the comics is also a rich learning opportunity for our student artists. Besides honing their artistic skills, the development of the web comic mimics real-world project development: students learn to communicate with clients (the library faculty), respond to multiple sources of feedback, collaborate with each other, create a timeline, and meet deadlines. The Researchers, Issue 2: Who’s Art Nouveau? Francisco Morillo has a challenging assignment in his design class: to create a poster in an artistic style he’s never heard of. But when a visitor from another era turns up, Francisco is swept away on a journey through the great works of the movement known as Art Nouveau. Along the way, he is introduced to basic skills he can use to investigate a new topic, focus in on crucial issues, and formulate his own perspective on what he’s learned. 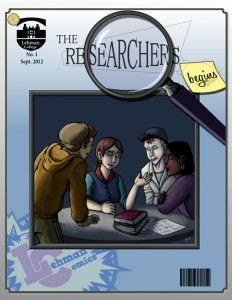 The Researchers, Issue 1: The Researchers Begins! Elizabeth Gomez, Francisco Morillo, Jasmyn Willis, and AJ Reilly are friends and classmates at Lehman College. In the first issue, The Researchers Begin!, Liz discovers her mother has diabetes and she and her friends set out to learn more about the disease. A comic about Marisol Alvarez and her academic adventures at Lehman College. 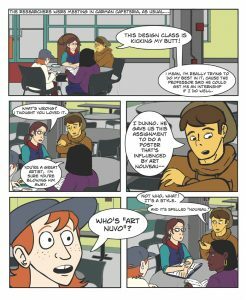 Created to help students understand difficult topics in a friendly and familiar medium, this webcomic adheres to the ACRL Information Literacy Competency Standards for Higher Education. Financial support provided by Friends of the Lehman College Library.